Chocolate and salted caramel pretzel layer bars - the title is quite a mouthful... which is appropriate given the size of these tasty morsels. Yes, another recipe! After spending months not actually baking (blame getting a new kitchen and how long that took!) I'm determined to try something new 3-4x a month. Especially as we also have an employee at pipdig towers (lol, our flat) now, so I've got an extra mouth to feed baked goods too which makes me 10x more motivated to get the oven on. Autumn/Winter is the best time for baking, too, so expect some pretty comforting bakes and a shocking amount of cinnamon and brown ugar to appear on this here blog. 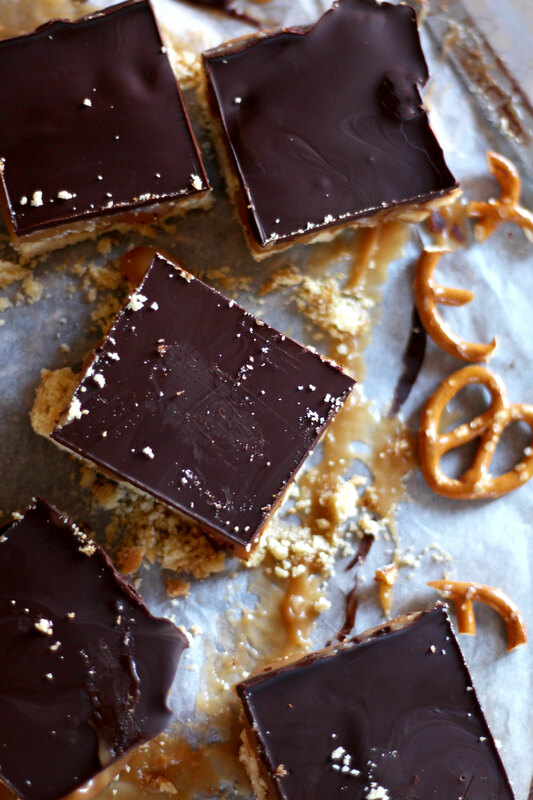 So, back to the salted caramel pretzel bars. I went food shopping the other day and stopped in the snack aisle (my favourite place) and had a sudden, overwhelming feeling that I wanted to eat pretzels. They're not something I get regularly, but they are damn delicious and knew they had to go into a bake. But what would go with them? That's when this recipe from my fave Sally's Baking Addiction popped up and I knew I had to try it. Not only is it super easy and takes minimal effort, but it combines some of my favourite flavours. I love any form of slightly crumbly base (millionaire's shortbread is a long term fave), I love salted caramel and I love any form of chocolate layer ontop (be it buttercream, ganache...) - delicious! The butter should be firm and cold, but not rock hard. Take it out of the fridge and allow it to sit at room temperature for 10 minutes prior to using it. Add in the flour, granulated sugar, salt, egg yolk and vanilla the mix until it's slightly crumbly in texture. Combine to a dough with your hands, then press it into the tin. In a medium saucepan on a medium heat, heat the sugar and stir continuously until lumps form then it will dissolve into an amber coloured liquid. Do not let it burn! Add in the butter in small chunks, it will bubble up so be careful. Slowly pour in the cream, then remove from the heat and stir in the salt. Allow this to cool slightly, then pour over the base. Chill once more. Place chocolate (broken up into small chunks) and coconut oil in a bowl and heat in the microwave. Do 15-20 second bursts at a time, then stir in between until fully melted. Pour this over the caramel and allow to cool once more. Cut into bars and keep in an airtight container for up to a week.